Changes in global terrestrial uptake of carbon dioxide, water use efficiency and ecosystem evapotranspiration during 1982-2011. Land plants are absorbing 17% more carbon dioxide from the atmosphere now than 30 years ago, our research published today shows. Equally extraordinarily, our study also shows that the vegetation is hardly using any extra water to do it, suggesting that global change is causing the world's plants to grow in a more water-efficient way. The ratio of carbon uptake to water loss by ecosystems is what we call "water use efficiency", and it is one of the most important variables when studying these ecosystems. Our confirmation of a global trend of increasing water use efficiency is a rare piece of good news when it comes to the consequences of global environmental change. It will strengthen plants' vital role as global carbon sinks, improve food production, and might boost water availability for the well-being of society and the natural world. Yet more efficient water use by the world's plants will not solve our current or future water scarcity problems. Plants growing in today's higher-CO₂ conditions can take up more carbon – the so-called CO₂ fertilisation effect. This is the main reason why the terrestrial biosphere has taken up 17% more carbon over the past 30 years. The enhanced carbon uptake is consistent with the global greening trend observed by satellites, and the growing global land carbon sink which removes about one-third of all CO₂ emissions generated by human activities. Increasing carbon uptake typically comes at a cost. To let CO₂ in, plants have to open up pores called stomata in their leaves, which in turn allows water to sneak out. Plants thus need to strike a balance between taking up carbon to build new leaves, stems and roots, while minimising water loss in the process. This has led to sophisticated adaptations that has allowed many plant species to conquer a range of arid environments. One such adaptation is to close the stomata slightly to allow CO₂ to enter with less water getting out. Under increasing atmospheric CO₂, the overall result is that CO₂ uptake increases while water consumption does not. This is exactly what we have found on a global scale in our new study. 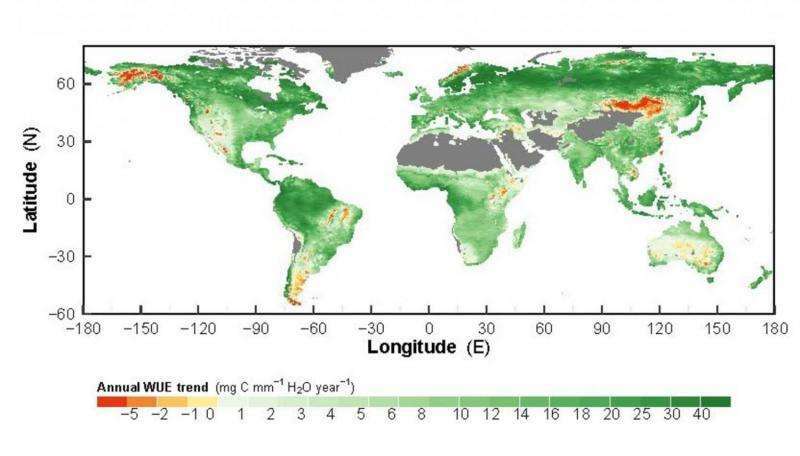 In fact, we found that rising CO₂ levels are causing the world's plants to become more water-wise, almost everywhere, whether in dry places or wet ones. Trends in water use efficiency over 1982-2011. We used a combination of plot-scale water flux and atmospheric measurements, and satellite observations of leaf properties, to develop and test a new water use efficiency model. The model enables us to scale up from leaf water use efficiency anywhere in the world to the entire globe. We found that across the globe, boreal and tropical forests are particularly good at increasing ecosystem water use efficiency and uptake of CO₂. That is due in large part to the CO₂ fertilisation effect and the increase in the total amount of leaf surface area. Importantly, both types of forests are critical in limiting the rise in atmospheric CO₂ levels. Intact tropical forest removes more atmospheric CO₂ than any other type of forest, and the boreal forests of the planet's far north hold vast amounts of carbon particularly in their organic soils. Meanwhile, for the semi-arid ecosystems of the world, increased water savings are a big deal. We found that Australian ecosystems, for example, are increasing their carbon uptake, especially in the northern savannas. This trend may not have been possible without an increase in ecosystem water use efficiency. Previous studies have also shown how increased water efficiency is greening semi-arid regions and may have contributed to an increase in carbon capture in semi-arid ecosystems in Australia, Africa and South America. These trends will have largely positive outcomes for the plants and the animals (and humans) consuming them. Wood production, bioenergy and crop growth are (and will be) less water-intensive under climate change than they would be without increased vegetation water use efficiency. But despite these trends, water scarcity will nevertheless continue to constrain carbon sinks, food production and socioeconomic development. Some studies have suggested that the water savings could also lead to increased runoff and therefore excess water availability. For dry Australia, however, more than half (64%) of the rainfall returning to the atmosphere does not go through vegetation, but through direct soil evaporation. This reduces the potential benefit from increased vegetation water use efficiency and the possibility for more water flowing to rivers and reservoirs. In fact, a recent study shows that while semi-arid regions in Australia are greening, they are also consuming more water, causing river flows to fall by 24-28%. Our research confirms that plants all over the world are likely to benefit from these increased water savings. However, the question of whether this will translate to more water availability for conservation or for human consumption is much less clear, and will probably vary widely from region to region.